No, it's not really my recipe. It's my version of Julie Hasson's recipe, and we love it! It's not dry and almost tasteless like other tofu scrambles I've sampled. We have been eating very simply these days (between guests) and this recipe just seems to be the ticket when you want something quick, tasty, simple and versatile. Even my picky brother-in-law liked it! I really like this recipe when made with medium-firm tofu pressed for 1/2 an hour in the Tofu Xpress gadget that I blogged about here, and Julie blogged about here. The tofu is firm, and yet has a silky texture that really "feels" like scrambled egg! UPDATE AUG 2012: Recently I blogged about a new tofu press, larger capacity, handmade wood, that would work much better if you are using this recipe for a crowd. You can order it here, and read about it (with pics) here. In the recipe below, I use 16 oz. of medium-firm tofu pressed for about 1/2 hour in the Tofu Xpress, which results in about 12 to 8.2 oz. firm, but smooth and silky, tofu. 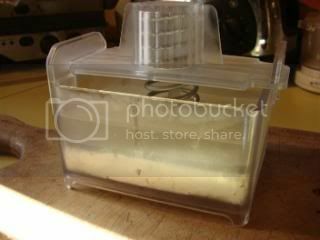 If you do not own a tofu press, you can find various methods on the Internet. Here is a good one, but I don't think it's necessary to press for 24 hours, as it says! You can see how much water is in the press in the picture above, and you should get as much out with a similar amount of pressing time using the method I linked to. We had Julie's Tofu Scramble over steamed asparagus for dinner the other night-- very satisfying! Julie says, "I love to serve this scramble with toasted bread for breakfast, or with gravy and quinoa for dinner. 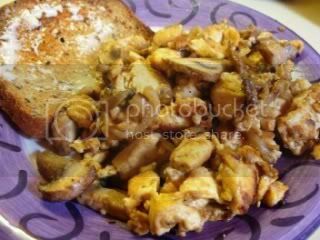 Any way you serve it, Tofu Scramble is great anytime of the day." I agree! We sometimes have it for dinner served over roasted or steamed asparagus, and sometimes I add strips of bell pepper, or a tablespoon of vegan "bacon bits" or chopped vegan "bacon" or "ham", or a bit of pesto, etc., to the mix. Mix the nutritional yeast together with the turmeric, and granulated onion and garlic in a small dish, and set aside. Heat a medium to large nonstick, cast iron or hard-anodized aluminum skillet over medium-high heat. (I use a well-seasoned spun carbon-steel wok.) Add 2 tsp. of oil so that the bottom of the skillet is very lightly coated. Break the tofu into small pieces and add them to the hot skillet. You can further break up any large pieces of tofu with a spatula. Let the tofu cook, stirring occasionally, until the tofu is starting to turn golden. Sprinkle the nutritional yeast mixture over the tofu, stirring so that all of the tofu is coated. Add 2 teaspoons more oil to the skillet, along with the sliced onion, mushrooms and garlic. Cook, stirring occasionally, until the onion is no longer crunchy. Sprinkle with pepper (if desired) and drizzle with the soy sauce, stirring until liquid is absorbed. 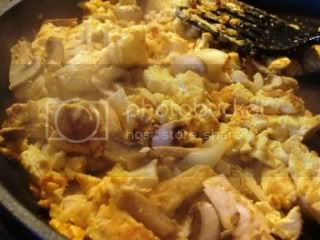 Remove skillet from heat and serve the scramble warm, with toasted bread or hash brown potatoes, if desired. Nutrition (per 1/4 of the recipe): 99.3 calories; 52% calories from fat; 6.1g total fat; 0.0mg cholesterol; 235.0mg sodium; 277.6mg potassium; 5.5g carbohydrates; 2.1g fiber; 1.6g sugar; 3.4g net carbs; 8.0g protein; 2.1 points. Nutrition (per 1/2 of the recipe): 196.2 calories; 52% calories from fat; 12.2g total fat; 0.0mg cholesterol; 319.9mg sodium; 547.1mg potassium; 10.7g carbohydrates; 4.2g fiber; 3.2g sugar; 6.5g net carbs; 15.8g protein; 4.1 points. A summer lunch-- Denman Island corn and homegrown tomatoes (and basil!) with homemade salsa (for the corn) and homemade vegan low-fat mayonnaise (for the tomatoes). The above is a frequent lunch these days, as we eat corn on the cob and fresh sliced tomatoes virtually ONLY in season, when we can eat corn within a few hours of picking, and our own fresh tomatoes. They are soooooo good in season that nothing else is ever as good, so why bother? I tell you, that last tomato sandwich of the early Fall is so sad! We have had alot of company (and alot of fun! ), but not much time to cook anything fancy or to blog! Some of my grandchildren at play on the Denman playground. I'm also dancing regularly again, which is great exercise and more fun! (I have lost 20 lbs. so far, BTW!) This also takes up some of my time, but I decided that I need to take more time to do both exercise and something for myself, and bellydancing meets both criteria! This was the recipe she used. Pam said that she used agave nectar instead of sugar and didn't have any tarragon. It was delicious and, as you can see from the photo, spectacular! Of course, she didn't use the cheese in the recipe, and she used butter lettuce and a mixture of toasted seeds instead of pistachios for the salad itself. I served a Greek spinach rice pilaf; Turkish-style red lentil patties; Breast of Tofu with lemon wedges; vegan Key Lime Bars; grilled zucchini and pattypan squash with olive oil, lemon juice and basil; and the following bean dish, which sounds so simple you wonder how it can be that good, but it is, and was eaten enthusiastically by all. Wash and drain the peppers and pat them dry. Cut away the stems, cut them in half lengthwise and remove the seeds. Cut the peppers into thin strips (about 1/8" wide). Heat the olive oil in a large cast iron, anodized aluminium, or nonstick skillet. When hot, add the onions and cook over medium-high heat, stirring often, until they wilt and begin to brown a bit. Add the garlic and peppers and toss well. Cover and cook over medium heat until the peppers are quite soft, about 20-30 minutes. There should be enough liquid from the vegetables to keep the mixture from sticking, as long as the heat is not too high. The vegetables are braising in the oil and their own juices and there should be some "sauce" in the pan when they are done. Stir in the vinegar and season to taste with salt and pepper (add the basil , if using). Stir in the rinsed, drained beans. Scoop the dish into a serving bowl and serve right away, or allow to come to room temperature before serving. if you refrigerate it, let it come to room temperature before serving, or reheat it. Nutrition (per serving): 389.0 calories; 12% calories from fat; 5.6g total fat; 0.0mg cholesterol; 20.5mg sodium; 1948.8mg potassium; 66.2g carbohydrates; 16.8g fiber; 5.4g sugar; 49.4g net carbs; 22.7g protein; 7.4 points. I promised to post this recipe from my newsletter, The Vegan Feast, posted last Thursday, so here it is! You can make this pie with any squash, but the yellow pattypan squash is particularly pretty. You can make the "Cheesey" components days ahead (links to the recipes in the Ingredient List), if you like, but the Tofu Feta Crumble and Tofu Ricotta are both very quick and easy to make. This is a "rustic" or "freeform" pie, in which you make one large circle of pastry and fold or pleat the excess on the edges up over part of the filling, leaving some showing in the middle. PS: If you prefer, you can omit the pastry and use 12 sheets of commercial phyllo pastry brushed with olive oil. Use a 12" round baking pan and use 7 sheets on the bottom and 5 on the top. Layer the squash in a colander, lightly salting each layer with kosher salt. Press the squash down in the colander with a bowl that fits into it, weighed down by a jar of water or some cans. Let it drain for 30 minutes. Make the pastry and the filling while the squash drains. In a medium bowl, mix together the Tofu or Almond Ricotta, the Quick Tofu Feta Crumble, and the soy yogurt or Tofu Sour Creme and set aside. Rinse the squash and pat dry with a clean tea towel. Have ready a 14" round pizza pan , sprayed with oil from a pump sprayer . Roll the pastry out into an 18-20" round (doesn't have to be perfect!). Roll it up around the rolling pin, loosely, and transfer it to the pan by starting at the top of the pan and unrolling the pastry over the pan. Spray the dough with oil from a pump sprayer or brush lightly with olive oil. Toss most of the squash slices with the flour in a bowl-- leave enough squash slices to decorate the open top (about 6" in diameter) of the pie un-floured. Layer 1/2 of the floured squash neatly in overlapping circles on the pastry. Dot generously with 1/2 of the ricotta/feta/yogurt mixture, sprinkle with salt and pepper and 1 tablespoon of the mint. Repeat the layering. Place the unfloured squash decoratively on top of the last layer of Filling, sprinkle with salt and pepper, and more mint, if you have it. Carefully bring the edges up around the filling, to make a freeform pie. Pleat the edges of the dough over the filling, leaving about a 6" open circle in the center. Cover the squash in the open circle (not the pastry) with a circle of foil cut to fit. Spray or brush the outside of the pastry lightly with oil. Bake for about 1 hour, or until the pastry is golden. Cool on a rack for at least 15 minutes before cutting into wedges and serving. Nutrition (per serving): 295.2 calories; 35% calories from fat; 12.2g total fat; 0.0mg cholesterol; 701.2mg sodium; 499.0mg potassium; 35.4g carbohydrates; 3.2g fiber; 3.6g sugar; 32.2g net carbs; 13.2g protein; 6.3 points. I've got company coming any minute, but I wanted to blog something, so I'm going to tantalize you with photos of two dinners we had last week, and I'll post a recipe or two from them on Monday! L- Beets and Greens with Vegan Yogurt Dressing , Middle- A spicy squash and cauliflower salad (Update in Aug 2011-- I don't know where that recipe came from-- maybe here? ); and R-scrambled tofu with vegetables in the style of Shakshuka, a North African egg and tomato dish that has traveled to Middle Eastern countries in various forms-- this one is more in the Iraqi style with a scramble and vegetables). For dessert we had homemade popsicles! Last Sunday night we had one of our communal vegan dinners with some vegan friends, hosted by Mike and Fireweed this time (we alternate). The theme was locally grown and what a gorgeous meal! The table set with gazpacho and slices of 2 savory tarts that I made. Close-up of the tarts-- they were sliced and arranged around a bowl of homegrown cherry tomatoes-- one was a savory rustic Italian greens tart (recipe in my new cookbook World Vegan Feast ), and the other was a Greek-style pie made with our home-grown yellow patty-pan squash (See recipe here). Ellen's green salad-- chock-full of goodies like pumpkin seeds, broccoli, cauliflower, etc. 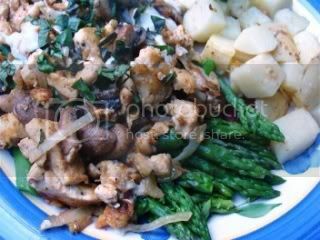 Pelka's delicious green bean and shiitake mushroom casserole! Fireweed's veggie kebabs in a pineapple!